Detailing actions to which the federal partners have committed from 2014 through 2016, the updated plan likewise seeks to leverage opportunities to improve the coordination of viral hepatitis activities across all sectors. To help nonfederal stakeholders identify ways they might engage, the updated plan details a number of specific opportunities for individuals, health professionals and professional organizations/associations, schools and training programs, community-based organizations, and patient and advocacy groups. And we are interested in identifying more. Several participants in our recent consultation on expanding roles and opportunities for nonfederal stakeholder involvement in the Viral Hepatitis Action Plan encouraged us to share a tool – a stakeholders’ workbook – that we used during that meeting with the broader community. 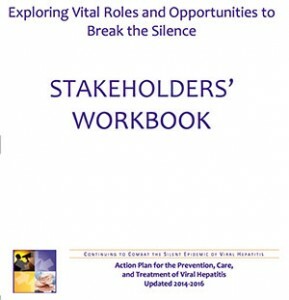 They felt that this workbook could be a useful tool for organizations – or even individuals – who would like to find ways to become active participants in pursuit of the Action Plan’s goals. Noting that some organizations have used the Viral Hepatitis Action Plan to inspire and inform their own planning, participants thought that the workbook could be a useful tool for organizations to use to map out such activities. For groups new to this field, the workbook can be used to identify and prioritize activities and partnerships and for longtime partners, it may be useful in strategic planning updates or to reframe or focus current initiatives. So, we are pleased to share this Viral Hepatitis Action Plan Stakeholders’ Workbook (Word file, PDF). Organized around the Action Plan’s six priority areas, this workbook was created to assist you in identifying innovative and actionable opportunities – customized to fit your mission and priorities – that complement, amplify, and/or extend the actions detailed in the updated Viral Hepatitis Action Plan. The workbook provides key questions to guide activity planning and policy development by stakeholder organizations. By responding to the questions in the workbook, you can develop specific plans for focused actions that you, your organization, and partners can take; identify partners to work with; and design key messages for communicating issues around viral hepatitis. We know of at least one national organization that plans to make use of the workbook for just this purpose soon. We invite you to review the workbook and determine if it – or any part of it – could be a useful planning tool for your work. We welcome your feedback on this tool as well as information about any activities you or your organization may be undertaking that are aligned with the updated Viral Hepatitis Action Plan. We hope to share examples of such activities by nonfederal stakeholders in future blog posts. Working together, various stakeholders can improve our nation’s response to viral hepatitis and achieve the Viral Hepatitis Action Plan’s lifesaving goals.